Here is a staggering statistic….did you know that 85% of all school districts in the U.S. report at least one case of head lice each year? Thankfully, as children head back to school this year you can rely on Fairy Tales hair care products. Fairy Tales hair care for children was created to provide natural head lice protection that is derived with organic rosemary, tea tree and citronella oils. I really like that this clinically proven effective preventative hair care system uses naturally derived repellents instead of harsh chemicals so I can feel confident that it is safe when using it on my children’s hair. All of the hair care products have a wonderful, fresh scent that is not overpowering and my children’s hair was left feeling clean and moisturized. My children are homeschooled so I use these products when they are going to large gatherings or special events. We also live in Florida and spend a lot of time outdoors so I use Fairy Tales hair care products to wash, condition and style the entire family’s (and our dogs) hair when we go camping outdoors. I find that it is an excellent bug repellent and even my once skeptical husband uses it when we are heading outdoors too after he noticed that he was being attacked by insects while the rest of us were sitting quite comfortably with no bugs bothering us! The Rosemary Repel® Shampoo includes pure Rosemary Oil instead of using just the extract. It has a nice lather and a little bit of this product goes a long way. My children’s hair felt clean but was not stripped of the nourishing oils because it also contains jojoba and fruit extracts. I follow up by applying a small amount of Rosemary Repel® Crème Conditioner. This product has a nice consistency that glides through the hair. I leave it in while they soap up the rest of their bodies and then it rinses away leaving their hair easy to comb and silky. Next, I spray their clean, damp hair with the Rosemary Repel® Leave-in Conditioning Spray which provides maximum protection (don’t forget to spray behind the ears, back of neck and shoulder tops). I like that it also offers extra conditioning to my daughter’s hair which tangles easily. Once their hair was dry it did not have any frizz and it helped with those pesky fly away hair strands too. We use the Rosemary Repel® Spray and Shield as a styling aid to provide a “seal” to the hair and “keep lice out.” It is a lightweight formula that does not weigh the hair down and it provides long lasting lice and bug protection. Overall, we really like the Fairy Tales hair care system for our family especially in situations where we want to provide maximum lice and bug protection. These products will remain a health and beauty staple in our household when we are going camping, heading outdoors or attending large group functions. 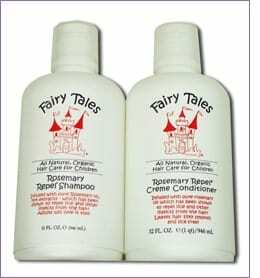 You are invited to visit the Fairy Tales website to purchase the products in the Rosemary Repel® hair care line. There is also a wealth of information about lice prevention available and even a new Facts of Lice iPhone app.